The staff at Friendly Ford in Roselle, Ill., modified a 2001 Ford Excursion, including raising the roof 18 inches, to make a more comfortable ride for Teddy the miniature horse. Friendly Ford in Roselle, Ill., about 28 miles northwest of Chicago, lives up to its name. The dealership kicked in about $20,000 -- and many of the staff donated their time -- to refurbish and modify a 2001 Ford Excursion that is used for a unique purpose: to transport a miniature horse named Teddy. Teddy, who stands just 32 inches tall, visits children and adults with physical and cognitive disabilities to cheer them up. 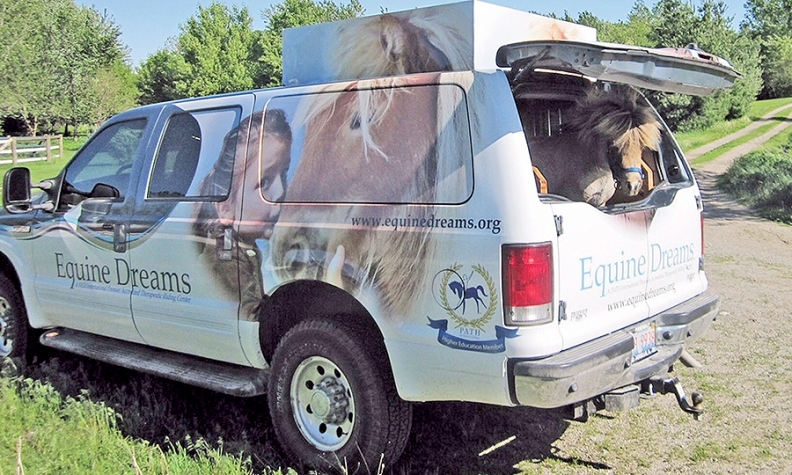 The 5-year-old horse outgrew his old ride, but a standard Excursion wasn't big enough. So dealership staff and several local businesses revamped the vehicle, raising the roof 18 inches and adding features in the back to make the giant SUV look like a horse stall. Teddy is owned by Equine Dreams, a nonprofit charity.